In order to be compliant with The Joint Commission’s requirements of establishing and tracking practitioner competency using measurable data, MSOs must apply and adopt a standard framework defining the dimensions of privileged practitioners’ performance. But just like all healthcare regulations, the focused professional practice evaluation (FPPE) of providers is a process that is constantly changing and being refined. With an evolving provider landscape and commensurate legal findings, knowing how to collect, organize, and document FPPE data is critical for all facilities. Failing to gather and organize sufficient FPPE data in a standardized way presents risks including redundancy, inconsistency across specialties, and inadequate articulations for practitioners regarding their role in FPPE. 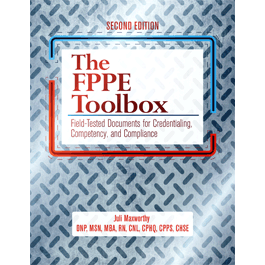 The second edition of The FPPE Toolbox: Field-tested Documents for Competency and Compliance, provides an up-to-date, comprehensive resource with the forms and tools MSOs need to conduct and manage FPPE. This book provides compliant and customizable forms, policies, letters, scorecards, and reports that can be utilized in facilities of all types and sizes. Author Juli Maxworthy, DNP, MSN, MBA, RN, CNL, CPHQ, CPPS, CHSE, shares her expert knowledge so MSPs can create a cohesive competency documentation process at their organization. Five organizations have FPPE down to a science, and they’ve shared their policies and forms in this book. These all-new, downloadable forms cover all aspects of FPPE for new applicants and for cause, from proctoring and other practitioner evaluation methods to quality indicators to compliance with The Joint Commission and HFAP standards. Juli Maxworthy, DNP, MSN, MBA, RN, CNL, CPHQ, CPPS, CHSE, brings nearly 30 years of nursing experience to her roles. Her last clinical position was vice president of quality and risk, where she had oversight of many of the activities of the medical staff. She has implemented OPPE and FPPE at the institutions in which she had oversight of the process. Through her work, she has learned how challenging and rewarding the implementation of these processes can be, both for organizations mandated to execute OPPE and FPPE to maintain their accreditation as well as the medical staffs working to understand and comply with those mandates.